Watch the report from Maggie Kent on Action News at 6 p.m. on August 1, 2018. PHILADELPHIA (WPVI) -- It was a packed courtroom Wednesday morning for the preliminary hearing of the 21-year-old man accused of fatally stabbing a real estate developer in Center City. At the hearing, Philadelphia District Attorney Larry Krasner withdrew the First Degree Murder charge against Michael White. White now faces 3rd Degree Murder and Voluntary Manslaughter charges in connection with the death of 37-year-old Sean Schellenger. The downgraded charges mean White, who had been imprisoned since turning himself in, could now be released on $15,000 bail and placed on house arrest. 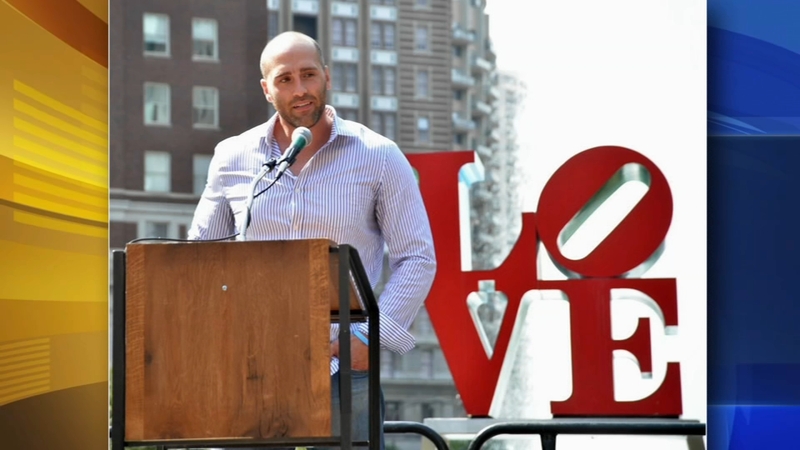 The mother of Center City real estate developer Sean Schellenger, who was stabbed to death near Rittenhouse Square last month, says she was manipulated by the Philadelphia district attorney after hearing of the reduced charges against the suspect. White is accused of fatally stabbing 37-year-old Sean Schellenger in the chest during an altercation near Rittenhouse Square on July 12th. White was delivering food on his bicycle before the fatal stabbing. He surrendered to police days later. "It is relevant both of the defendant ran and hid for a couple days and that he turned himself in," Krasner said. The DA says there is a video of the altercation, and that is what led his office to drop the first-degree murder charge. Sean Schellenger's mother, Linda, did not speak publicly after Wednesday's preliminary hearing. She did, however, speak with us on Tuesday night. Mother of Rittenhouse stabbing speaks, suspect's family holds vigil. Katherine Scott reports during Action News Mornings on August 1, 2018. "I haven't just lost a son to the justice system, I've lost him forever," Schellenger said. Krasner says the prosecution has been in touch with Schellenger's family, and that he didn't want them to be surprised at Wednesday's developments. Murder charges reduced in deadly Center City stabbing. Jim Gardner reports during Action News at 11 p.m. on August 1, 2018. It says quote: "I was manipulated by Larry Krasner. He was intellectually dishonest. He overruled his own prosecutors. They have clear video footage that would have allowed them to hold on murder 1 and no bail. Larry showed up at a preliminary hearing, which is rare, to grandstand for political purposes. My son has become his political pawn. I wanted to trust him. He breached and abused that trust." The District Attorney's office responded that their hearts go out to Ms. Schellenger but that "Top officials from the D.As Office, including D.A. Krasner and our Chief of Homicide, met with Ms. Schellenger for over two hours prior to today's hearing. The e-mail statement released this evening is starkly different from what Mrs. Schellenger repeatedly said....before, as well as during and after the preliminary hearing." The next court date is October 30th, at which time we will learn the official charge against Michael White: 3rd degree murder or voluntary manslaughter. Mother of Center City stabbing victim: I was manipulated by D.A.